This is the ultimate NYC city guide for those like me who love wellness, self-care, and beautiful things. I didn’t include many obvious attractions like museums and landmarks because you can find that information on any New York guide. Also, if you’re looking for my healthy NYC restaurant guide you can find it here. Started by one of the founders of Sephora, Credo Beauty is the Sephora of Natural Beauty. All of their beauty products are non-toxic and mostly organic. They have a great selection of makeup and knowledgable employees. It’s my go to place for rms and ilia products. Another go-to place for non-toxic, organic skincare and makeup. Cap Beauty also carries miscellaneous wellness products like adaptogens, matcha, incense, and candles. They also offer spa services. I buy my favourite Honey Girl Organic products here. A South Korean outpost that carries innovative and affordable beauty products. All their products use natural ingredient’s sourced responsibly from Korea’s Jeju Island with no harmful chemicals or preservatives. This is your go to place for inexpensive ($2) sheet masks. I personally love their sunscreen and clay masks. My husband and I are obsessed this store. They specialize in athletic ware for any occasion; whether it’s for tennis, dog walking, or yoga. The colour palette of their clothing is always swoon worthy. I love their matching bra and legging sets, and my husband swears by their thin lightweight t-shirts. Everlane started off as a popular online store and they now have a location in NYC. They produce sustainable basic clothes at an affordable price. I love their tee’s and tank bras. Known for women’s premium essentials, Cuyana believes in having a few very well made clothes and accessories. If you are looking for a perfect leather tote or other travel bag essentials, this is your place. I love my classic leather zip tote. Monogramming is offered for an additional $15. Every girls go-to spot is Reformation and for good reason. They sell pretty, sustainable, and easy to wear feminine dresses. It’s a go-to spot for anything floral. I love this beautiful store in NOHO. This designer is known for custom prints, intricate embroideries, and a feminine boho look. I like to visit the store when I know there will be sales. A must visit for those who are pregnant. They have great staples you can wear before, during, and after pregnancy. The store also offers pickles, candy, and ice cream. Eberjay sells the prettiest intimates, sleepwear, and swimwear. I’ve been successful at scoring cute sleep sets off the sale rack. Sometimes a girl just needs fresh pyjama set. Tai carries a vast selection of beautiful dainty gold jewellery, many with gemstones. I always have the hardest time deciding what to buy because everything is so pretty. The jewelry is mostly gold plated so it won’t break the bank. A wellness guru’s dream pantry would be Clover Grocery. The gourmet health food store has everything from organic spices, adaptogens, collagen, superfood chocolates, and speciality organic snacks. They also sell candles, beauty care, and have a small collection of produce, packaged food and a wellness bar at the back. If you’re looking for Coconut Cult yogurt, this is your place. Pencils, pens, and paper are anything but boring at this store. Their beautiful collection of supplies kind of makes me want to go back to school. Want to start journaling? Get your fancy pen and journal here. They also sell cute prints for $5. When moving to a new apartment I bought my bedding from this beautiful store. If you’re after basic sheets in neutral and soft colours then this is your place. They also sell attractive tabletop linens, towels, and robes. Not just a furniture store, ABC carries a variety of beauty and wellness products. The entire store has a very zen like appeal. Visit for makeup, skincare, incense, meditation pillows, or table top. It also has three great restaurants: abcV, abc cocina, and abc kitchen. This gorgeous store sells beautiful furniture, tabletop, and home décor accessories. The price point is high, so I usually browse for visual pleasure. 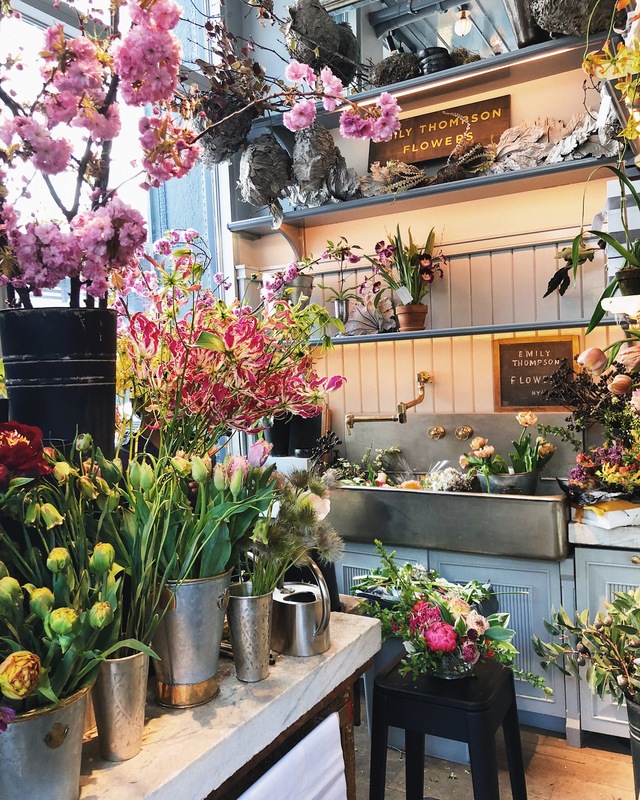 However, it’s worth eating at the French restaurant La Mercerie and checking out Emily Thompson’s gorgeous Flower Stand. I recently spotted Blake lively and Ryan Reynolds shopping here! This may sound a little out there, but this store can read your aura with their aura reading camera. The photo captures your image along with the different colors your aura is omitting. The store expert then provides a reading explaining what your aura means and how you can improve your life. I went with my sister and both our readings were pretty accurate! Color Me Mine is the perfect rainy day, or any day activity. I find it fun and therapeutic to spend the afternoon painting a plate or a mug. You may be surrounded by kids, but adults deserve to be creative as well. An obvious NYC activity, but for good reason! It’s a beautiful park to get lost in and clear your mind. Also, if you’re a dog lover you’re going to enjoy the dog watching/petting. I get off on just looking at a protea, so if you anything like me visit the flower district and browse natures beauty. If you live in the city invest in a nice plant to take care of. It’s good for your mental health and it makes for beautiful décor. Lots of the shops offer shipping for an inexpensive rate. A stunning, very cool, and airy yoga studio. It’s the kind of place that makes you wish you were a yogi. This is by far my favourite place in the city. The fresh produce gives me life and inspires my recipes. The best day to visit is Wednesday because they have lots of vendors but its not overcrowded. I love to visit Windfall Farm, She Wolf Bakery, Hawthorne Valley, and River Garden Flowers. I love it all. Laughter is the best medicine, so do it Comedy Cellar. It’s best to reserve tickets online in advance, no payment required. You may get lucky and watch a celebrity comedian. Listen up movie-goers, this is the nicest move theatre I’ve ever been to. I could probably watch any movie in their comfy leather reclining chairs with a little tray table for snacks. This is the place to see a movie. If you want to treat yourself to a little magic then get a non-toxic facial at CAP beauty. The treatment is excellent and the best part is you know they are using the best natural products on your face. Unlike Cap Beauty that has a zen like environment, Heyday is more of a chop shop for facials. It’s at a good price point and the products they use are clean. It makes it easy to care for your skin. One of the city’s best hide aways. Aire offers various baths surrounded by candlelight in an old textile factory. It’s the perfect romantic activity to do with your lover, or a great way to unwind with a friend or solo. I personally love the hot salt water bath. They also offer spa services. I’m a loyal customer to this spa for foot massages. At $25 for an hour foot rub what’s not to love? I like their big comfy reclining chairs and their polite staff. I bring my own lotion because I’m picky with my products. Best part is they give you a stamp card so you can work your way to a free foot massage. The go to place in the city for non-toxic manicures and pedicures. I must admit I’ve never been. I usually bring my own tenoverten polish to a local spot but it’s definitely on my list. You may have the inscape meditation app on your phone. They have an actual location for group meditation sessions. The studio is looks insanely cool and zen. I have yet to visit but I’m planning on it. This entry was posted in Lifestyle and tagged activities, beauty, clean beauty, facials, health and wellness, makeup, new york guide, NYC, organic beauty, self care, shopping, skincare, spa, wellness. Bookmark the permalink.